Safe Zone Relocate for Exile? Habe auch schon selber probiert es für Exile zum Laufen zu bringen...leider ohne Erfolg. Vllt. gibt es jemanden der so etwas hat und es hier mit uns allen teilen mag...wäre super nett. Geändert, getestet und für gut befunden. Wenn _useCustomPosition "true" ist - stehen deine Fahrzeuge in der @ _customPosition definierte Position. _maxDist = 1000; // Maximum distance from the safe zone position to find a safe position or custom position for relocation, setting this too low can make vehicles spawn very close to other vehicles. _objDist = 15; // Minimum distance from the safe position for relocation to the center of the nearest object. Specifying quite a large distance here will slow the function and might often fail to find a suitable position. when I restart the server vehicles are still in the safe zone. am I doing this wrong server side? 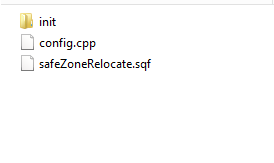 copy above to notepad ++ save the file as safezonerelocate.sqf change above to how you want it .. put that in custom folder .. Thanks I was thinking this had to be server side. They're open, due to exile settings. Don't! If you do this, everytime a player joins the server - the script get exectued. Therefor, once player joins the server all vehicles in safezone get ported! initServer.sqf is what you're lookin for.